An animation of the Pegasus deployment system and the launch of the IBEX spacecraft. An animation visualizing the orbit of the IBEX spacecraft relative to the orbit of the Moon. The green line shows the orbit of the IBEX spacecraft, while the gray line shows the orbit of the moon. An animation showing the position of the IBEX spacecraft and its field of view superimposed on a diagram of the heliosphere. The cones that extend from the IBEX spacecraft represent the field of view of the IBEX-Hi and IBEX-Lo Sensors as the Earth travels around the Sun each year. The black lines show how the data from the space craft is mapped to a two dimensional diagram over the course of a year. The data in the diagram is simulated data and the drawing is not to scale. An animation showing the position of the IBEX spacecraft and its field of view superimposed on a diagram of the heliosphere. The cones that extend from the IBEX spacecraft represent the field of view of the IBEX-Hi and IBEX-Lo Sensors as the spacecraft spins on its axis. The black lines show how the data from the space craft is mapped to a two dimensional diagram as the spacecraft spins four times a minute. The data in the diagram is simulated data and the drawing is not to scale. An animation of the IBEX spacecraft in orbit. Another animation of the IBEX spacecraft in orbit. An animation showing a face-on view of our Milky Way Galaxy begins the animation. 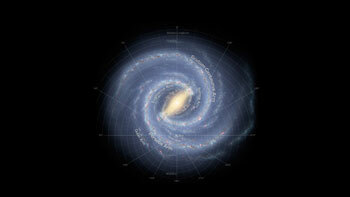 The Milky Way Galaxy is organized into spiral arms of giant stars that illuminate interstellar gas and dust. The Sun is in a finger called the Orion Spur. A zoom to the cluster of tenuous interstellar clouds close to the Sun reveals the cloud motions. The final zoom reveals that the Sun will soon emerge from the Local Cloud that now surrounds the Sun.